Broad Breasted White turkeys, the most common breed of turkey eaten for Thanksgiving. I recently spent time with a couple hundred Thanksgiving turkeys at the Stone Barns Agriculural Center, about an hour north of New York City. I give the details of my adventures in my latest article for Etsy, which you can read here. But roasting my turkey today got me thinking about those gobbling birds I met before they became dinner. Below, a conversation I had with Stone Barns livestock manager Craig Haney. There is a certain disconnect between these frisky turkeys and what ends up at Thanksgiving dinner. 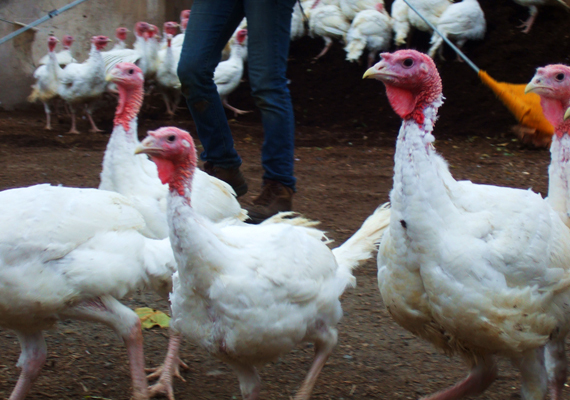 In less than two weeks, the turkeys would be slaughtered on site by the farmers who raised them. I asked Craig how that felt. For Craig, slaughtering the turkeys signals the end of the season, and the end to intensive farm labor for the year–just as it did 100 years ago or more. Craig doesn’t care which turkey ends up on his dinner table, he likes both the Broad Breasted Whites and the Bourbon Reds; but he has little to do with cooking on the big day. “My wife cuts me a lot of slack,” he admits. But it seems appropriate to the historic spirit of the holiday: Craig spent six months getting that bird from chick to carcass; but his wife will get it to the Thanksgiving table.